Major price reduction. Spacious split level custom built home on lodge hill. 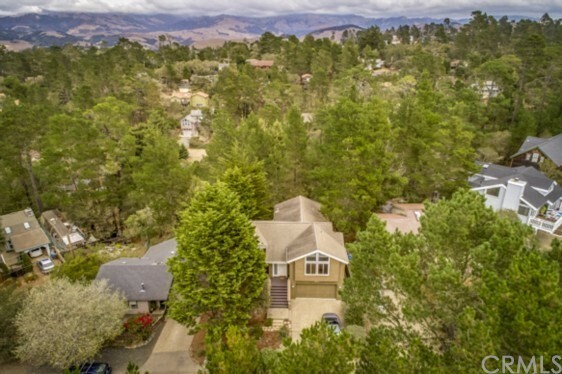 Un-blockable views of the forest and even a peek-a-boo ocean view through the pines and oaks. 6,900 sgft street to street 3 lot parcel with wooded open lots across the street. A truly wonderful neighborhood. High quality james glitch construction and mature very low maintenance grounds. Oak floors, tile, top of the line appliances, wired for sound system, gas fireplace, dual pane windows. View decks front and rear. Abundant storage and custom cabinets throughout. The step down living area has a wall of windows and a gas fireplace surrounded by custom cabinets and entertainment center. Formal dining room plus a spacious breakfast area off of the kitchen. Used lightly as a second home for the last 10 years. Vaulted ceilings, recessed lighting, 3 bedrooms and 2. 5 baths, 2,206 sqft. 2 car garage. Cambria â€œpines by the seaâ€� is the best kept secret on the california coast. Housing is very limited. The year round weather is excellent with warm winters and cool summers. Abundant with unique boutique shops, and restaurants of every type and price range. Very active community center, library, and the pewter plough playhouse for live entertainment. Cambria also has its own 24 hour 7 day emergency transportation system and fire department. Enjoy the open air farmers market every friday afternoon. Parks, preserves, easy ocean access, and open spaces are abundant. Now $925,000 hurry! For more information or make an appointment to see property ID SP18249133.